If you've been watching the World Series (and chances are you haven't), then you've been treated to a particularly exciting contest. The Rangers and the Cardinals might not be the biggest names in the league, but they've put on an exciting show. I still have a soft spot for Tony LaRussa thanks to his time with the A's, but I'm mainly rooting for the St. Louis in hopes of getting to see a seventh game. Today's a travel day, so at the risk of losing my sports credibility, I thought I'd share some thoughts on my favorite baseball video game: Ken Griffey, Jr. Presents Major League Baseball. As regular readers know, I don't play many sports games. It's not for lack of interest; I love watching sports and am quite interested in the strategy and athleticism behind them. It's just that sports games, like many other genres, have become increasingly specialized over the years. Imagine if someone who only played Doom dove right in to Battlefield 3? It's hard to simply jump into a current version of Madden or The Show without feeling overwhelmed. 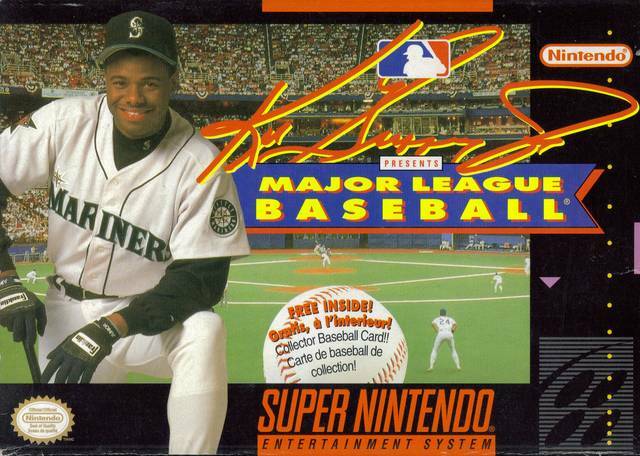 I played Griffey when it came out in 1994, and that's pretty much where my skill at baseball video games peaked. Griffey came out at a time when the line between arcade and simulation styles was blurrier than it is today. The game had deep rosters, accurate player statistics, and realistic representations of every major league stadium. At the same time, player collisions resulted in cartoonish fainting spells, fielders ran at twice the speed of on-base runners, and players routinely broke bats over their knees. It was the kind of game that let you play through an entire season and also regularly blast 500-foot homers. For some reason, my friends, cousins, and brother took a shining to the quirky title. Because the game wasn't licensed by the players' union, all the names (except for Griffey's) had been changed to thematic pseudonyms. The A's were made up of famous authors like Byron and Twain. Seattle unsurprisingly boasted a roster of Nintendo employees like Howard Lincoln and Dan Owsen. Because the stats, numbers, and teams were true to life, it was easy to figure out who was who, but I never bothered editing most of the names. There was something great about seeing "J. Wayne" of the Angels hit grand slams. When it got too dark to play three flies up, we would head inside and huddle around the TV, taunting each other with slow moves to first and disrespectful tag-outs. The hitting and pitching systems are rudimentary by today's standards, but they were more than adequate for strategic play as well as mind games. Just like in the real game, Griffey was as much about anticipating your opponent's decision as it was executing the play. Of course, the pros don't have to worry about their friends trying to slap the controller out of their hands in hopes of messing up an easy fly ball. Today, I can still remember that iconic intro song that played over the title screen. It's as if Joe Satriani was distilled into MIDI format. Also: check out the sick base solo at 1:24. It was the 1990's y'all! I spent so much time playing the game that modern sports games still strike me as eerily quiet. Alas, I feel like the day of digital organ-laden melodic loops are long passed. Perhaps more so than any other American sport, Baseball is steeped nostalgia. Our memories of it goes deeper than the stats we record about every pitch. The game marks the change in the seasons and gets intertwined with memories of growing up. In this way, Ken Griffey, Jr. Presents Major League Baseball is a fitting tribute to the sport. After all these years, I still recall it like some sprite-based sandlot; a digital field of dreams whose fantasy elements imbued its more realistic features with the magic necessary to make indelible memories.